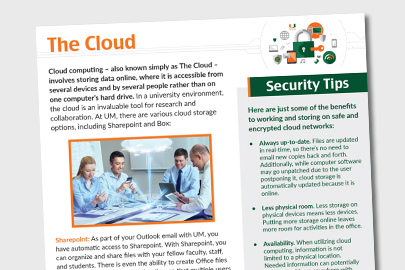 Security begins with good prevention and basic knowledge. 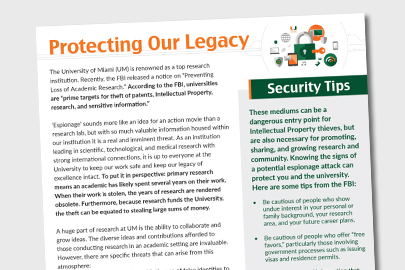 Learn more about information security and how to keep your data secure by reading our articles below. Twas the holiday season, when all through the house, Not a keyboard was stirring, not even a mouse. 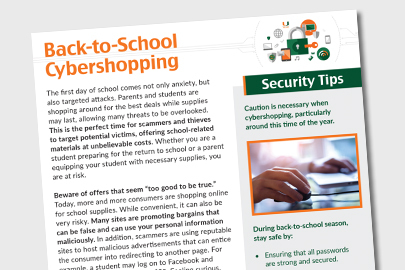 Back-to-School season is the perfect time for scammers and thieves to target potential victims, offering school-related materials at unbelievable costs. 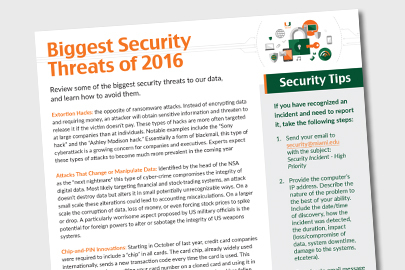 Review some of the biggest security threats to our data, and learn how to avoid them. 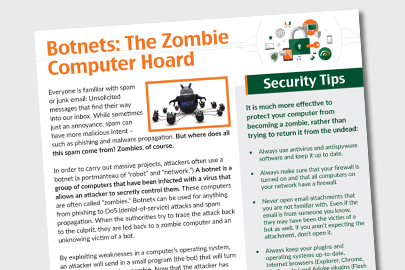 Everyone is familiar with spam or junk email: Unsolicited messages that find their way into our inbox. But where does all this spam come from? Zombies, of course. 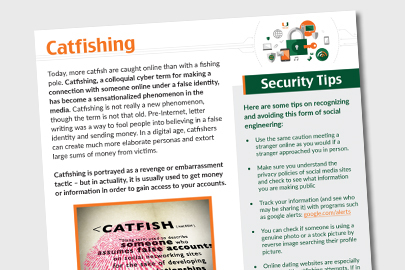 Catfishing, a colloquial cyber term for making a connection with someone online under a false identity, has become a sensationalized phenomenon in the media. 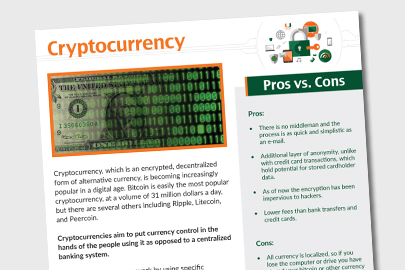 Cryptocurrency, which is an encrypted, decentralized form of alternative currency, is becoming increasingly popular in a digital age. 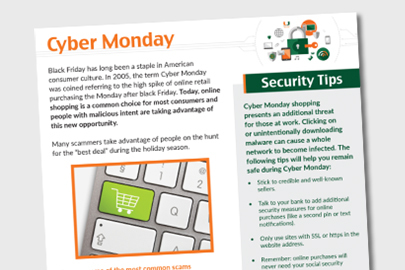 Cyber Monday refers to the high spike of online retail purchasing the Monday after Black Friday. Today, online shopping is a common choice for most consumers and people with malicious intent are taking advantage of this new opportunity. 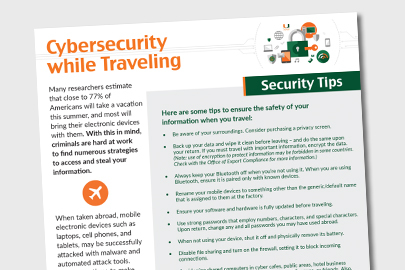 Close to 77% of Americans will take a vacation this summer, and most will bring their electronic devices with them. With this in mind, criminals are hard at work to find numerous strategies to access and steal information. 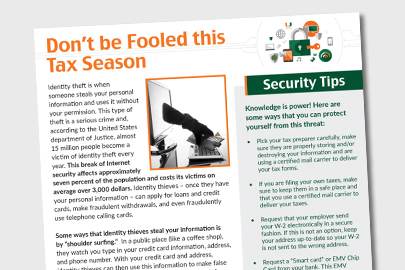 Almost 15 million people become a victim of identity theft every year. 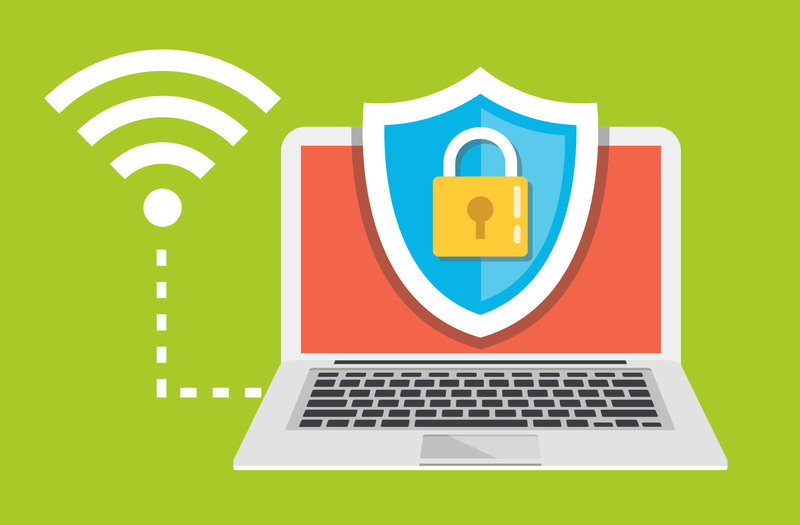 This break of Internet security affects approximately seven percent of the population, and costs its victims on average over 3,000 dollars. 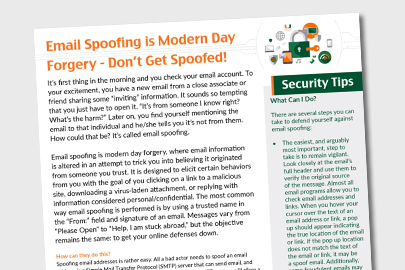 Email spoofing is modern day forgery, where email information is altered in an attempt to trick you into believing it originated from someone you trust. The name “Goldeneye” sounds like something out of a James Bond movie, right? 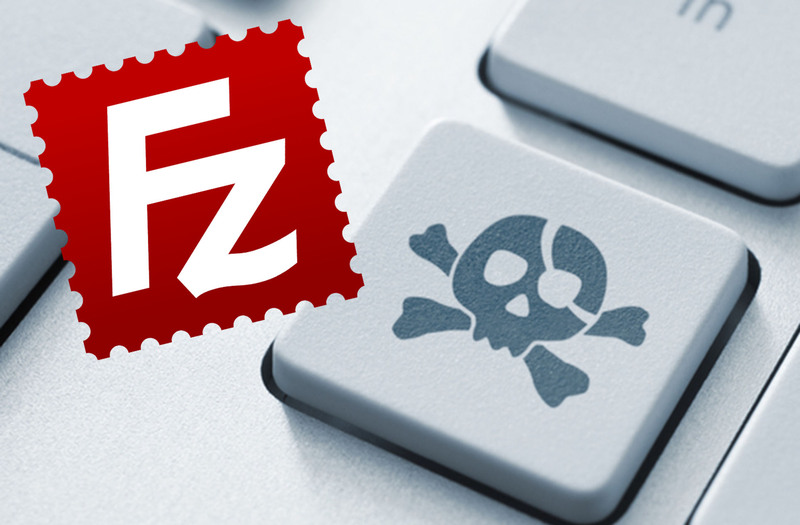 Well, it is also the name of a new ransomware to hit the online scene. Don’t let “Scrooge” ruin your holiday season. 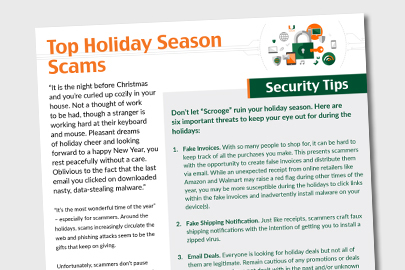 Take a look at six important threats to keep your eye out for during the holidays. 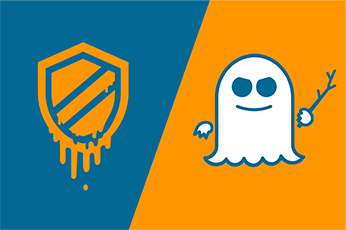 Is your computer acting strangely? Is it running slower than normal? 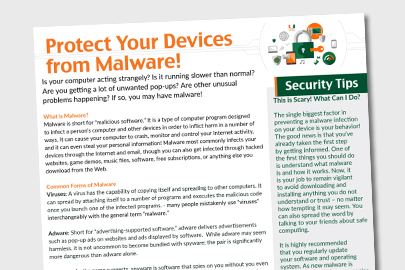 Are you getting a lot of unwanted pop-ups? If so, you may have malware! 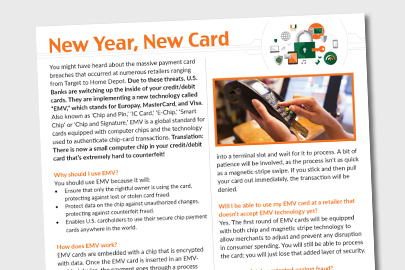 EMV is a global standard for cards equipped with computer chips and the technology used to authenticate chip-card transactions, which makes your card extremely hard to counterfeit! 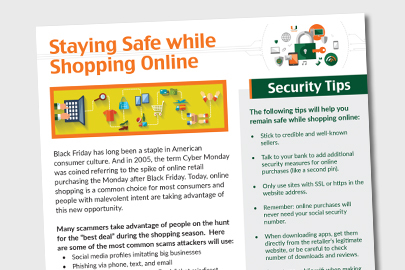 Many scammers take advantage of people on the hunt for the “best deal” during the shopping season. 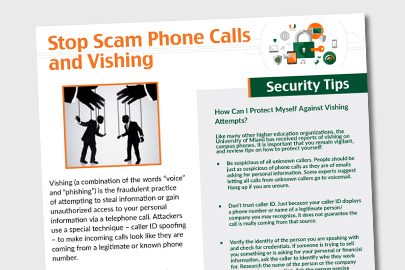 Take a look at some of the most common scams attackers will use. 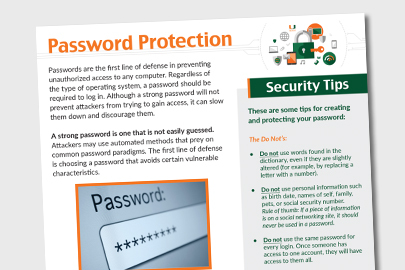 Although a strong password will not prevent attackers from trying to gain access, it can slow them down and discourage them. 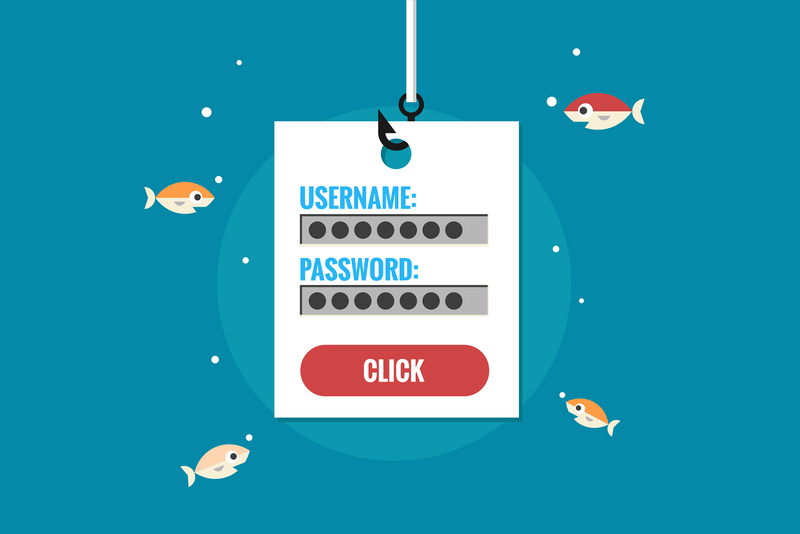 Phishing (pronounced “fishing”) is a form of fraud, in which an attacker tries to learn private information (such as login credentials or credit card information) by masquerading as a reputable entity or person. ‘Espionage’ sounds more like an idea for an action movie than a research lab, but with so much valuable information housed within our institution it is a real and imminent threat. 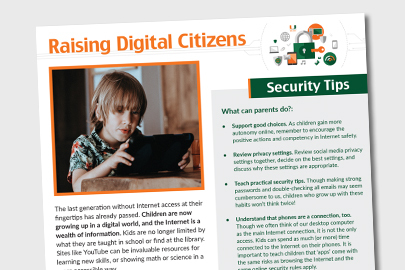 Children are now growing up in a digital world, and the Internet is a wealth of information. However, with the good also comes the bad. 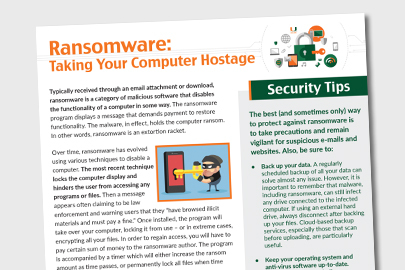 Over time, ransomware has evolved using various techniques to disable a computer. 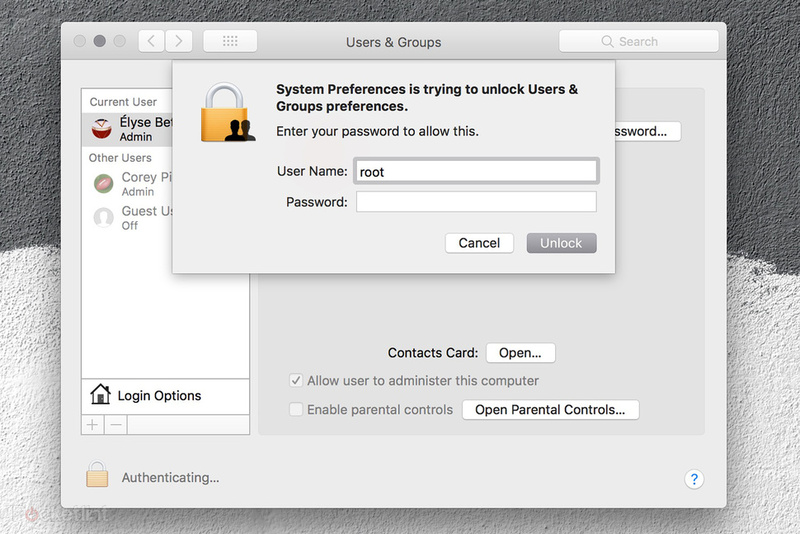 The most recent technique locks the computer display and hinders the user from accessing any programs or files. 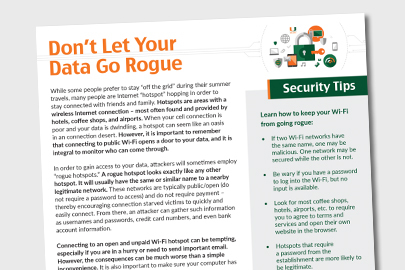 It is important to remember that connecting to public Wi-Fi opens a door to your data, and it is integral to monitor who can come through. 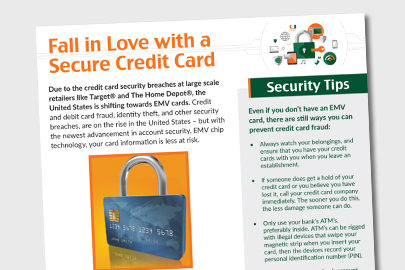 Due to the credit card security breaches at large scale retailers like Target® and The Home Depot®, the United States is shifting towards EMV cards. 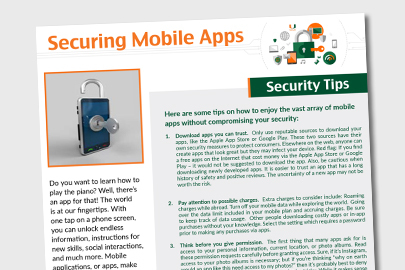 Take a look at some tips on how to enjoy the vast array of mobile apps without compromising your security. 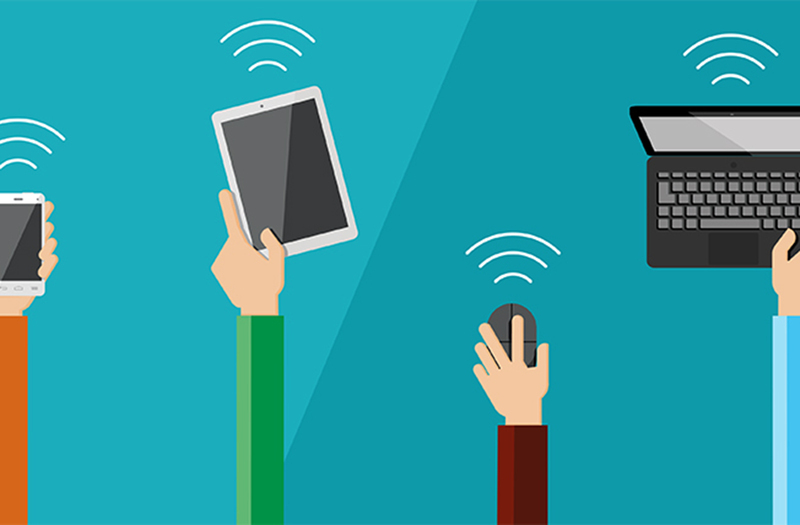 The more things we connect to our home connection, the more these devices are at risk to outside threats. 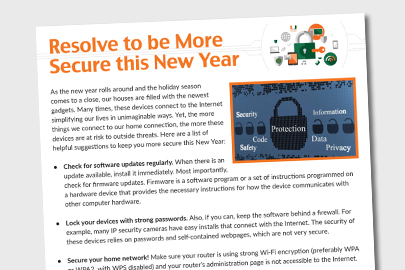 Take a look at these helpful suggestions to keep you more secure this New Year. 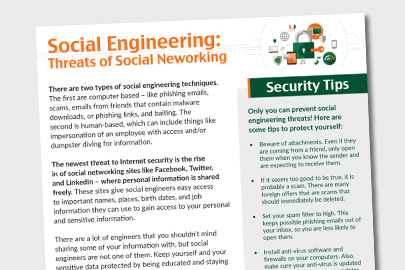 The newest threat to Internet security is the rise in of social networking sites like Facebook, Twitter, and LinkedIn – where personal information is shared freely. Cloud computing – also known simply as The Cloud – involves storing data online, where it is accessible from several devices and by several people rather than on one computer’s hard drive. 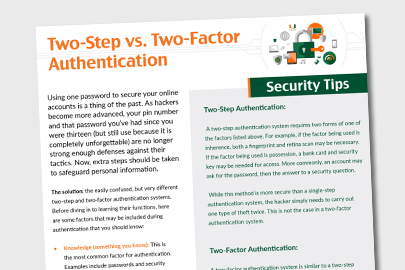 Using one password to secure your online accounts is a thing of the past. Now, extra steps should be taken to safeguard personal information. 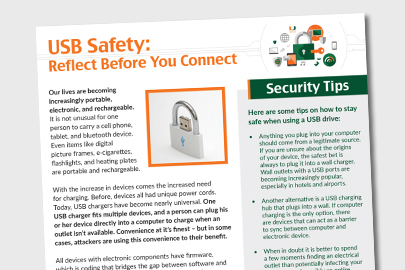 Nowadays, a USB charger fits multiple devices. Convenience at it’s finest – but in some cases, attackers are using this convenience to their benefit. 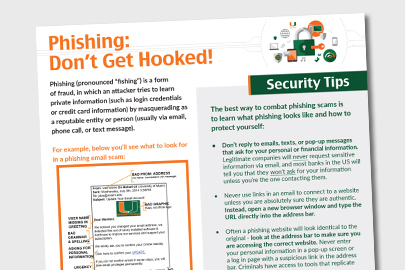 Vishing (a combination of the words “voice” and “phishing”) is the fraudulent practice of attempting to steal information or gain unauthorized access to your personal information via a telephone call.